Tryouts are held during February. All grades MUST be passing during tryouts and season. Anyone in jeopardy of failing the school year will not be allowed to tryout. 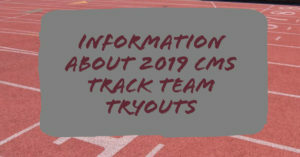 All student-athletes currently participating in another CMS sport will wait until that sport is finished before trying out for Track & Field. Everyone MUST have a current sports physical on file with the school. Physicals are good for 13 months. Athletes will not be allowed to tryout without a physical. Attendance for tryouts is mandatory. **Exceptions are only made for athletes currently participating in other CMS sports or through verbal parental contact. This means a phone call or face to face conversation with the coach for confirmation and understanding. Please note: Tryouts will be outside. Dress for the weather. Click here to access the registration form. Completion of this process does not guarantee the student athlete will be a member of the team. Coaches will make decisions on final rosters for each sport upon completion of tryouts. For a review of requirements and demonstration of conditioning exercises, watch Mr. Hayman’s video.